The GTC shouts out a huge Happy 46th Birthday to David “Trugoy The Dove” Jude Jolicoeur! Or simply, Trugoy…or just Dave. Up to you really. 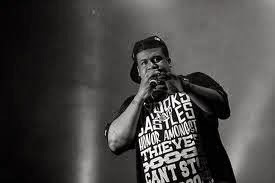 Trugoy is one third of the coolest if not groundbreaking hip-hop acts to hit the scene in the late 80s and into the early 90s, De La Soul. Crossing over into pop and rock circles, this group of Amityville (yeah that Amityville) poets and beat makers, Trugoy, Posdnuos & Plug Three, caused a sensation with their 1989 debut Three Feet High and Rising. Three Feet High and Rising hit the spot with simple, laid back tracks that were something a bit unexpected at the time when Gansta Rap was on the rise and the Beastie Boys had moved into a more experimental sound. As part of the alt-rap community Native Tongues Posse with names like Jungle Brothers, Mos Def, Queen Latifah & A Tribe Called Quest they started an anti-violent escape in the hip-hop world that almost immediately resonated with all genres of music fans. Trugoy (which is yogurt in reverse) or Dave and his De La Soul comrades are still out there creating cutting edge music that you should take the time to check out.